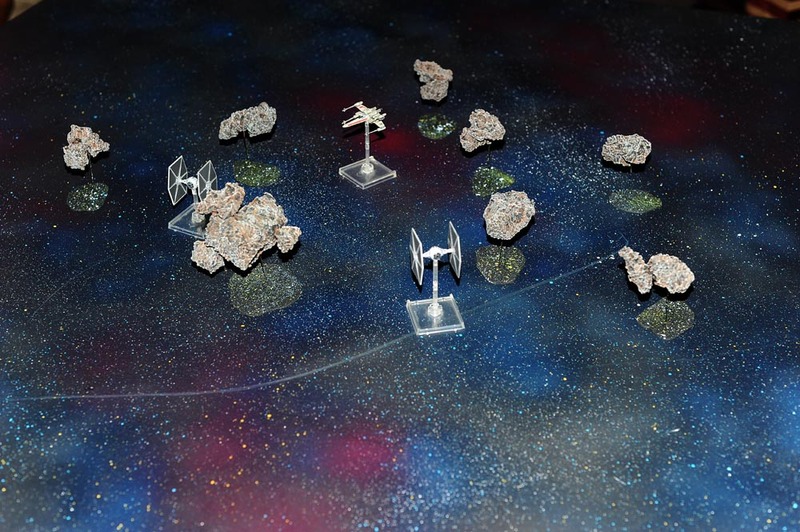 Nate Miller's Tabletop Games: Star Wars X-Wing asteroid terrain. Star Wars X-Wing asteroid terrain. I finished up a project I've had on the back burner for quite a while now. These asteroids are made from Styrofoam chunks that I melted with spray paint then painted up. I think they turned out okay but they are somewhat fragile and don't weigh enough to hold themselves down well. Still I think they will serve the purpose for the time being. I'm hopefully going to be playing some more X-Wing games soon. I plan to integrate the Fantasy Flight skirmish game into my new Star Wars roleplaying game that I will probably use Savage Worlds for. Wonderful and Grand. I especially like your playing mat and your asteroids. I'm not saying Star Wars but....... Star Wars!